We all know broadly what the Renaissance means, but what was it like to live in Europe when it was actually happening? 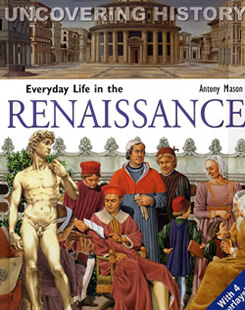 This book for older children places the Renaissance in the context of world history, and shows how it was experienced by those who were most involved or affected – artists, architects, traders, the Church, women. And it ‘uncovers history’ in more ways than one: selected pages have printed plastic overlays that allow the reader to see not only cut-away interiors of buildings, but how they looked on the outside as well.